Nothing cheers the cockles of my heart more than a dog wearing clothes. 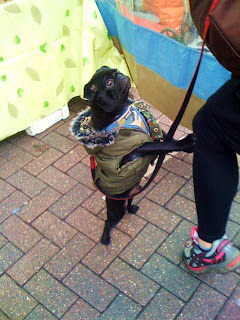 If I am ever feeling moody (which is pretty often) there's three things which will distract me; an amazing vintage bag (preferably a market full of them) a foreign supermarket (with jars of unusual jams and pickles) or a funny dog. If the dog happens to be wearing a bomber jacket then I will probably let out a small squeal and take a picture. The second picture was taken on my way to work. I wanted to be that dog so bad- all cosy and warm in his dog-bag. Look at those soft loppy ears! I'm doing a shoot for my website later today. I've been busy collecting. borrowing and buying clothes all week but hopefully the results will be good. The story is based around colour blocking and cos I couldn't find the perfect green top I am just about to attempt to make my own. The shoots starts in 4hrs and 24 minutes.. best get down the haberdashery then. PS no swearing in this post.. I'm saving it all for the speed sewing this afternoon..
can I have that pug please?